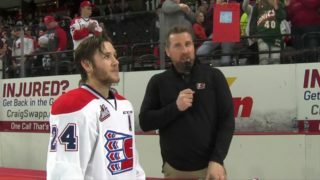 SPOKANE, Wash. — A four point night from forward Riley Woods wasn’t enough to save the Spokane Chiefs Sunday night, as the Portland Winterhawks scored four power play goals en route to a 8-6 victory. The two sides exchanged goals with four lead changes throughout the opening period before eventually heading into the first intermission tied at 3-3. 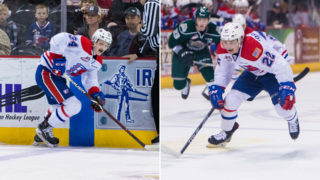 Riley Woods, Ethan McIndoe and Adam Beckman, on the power play, all scored for the Chiefs in the frame, while Woods, McIndoe and Jake McGrew all had two points in the period. Two of Portland’s goals in the period came on the power play. 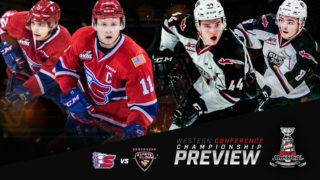 Spokane gained a 5-3 lead in the second on goals by Luke Toporowski and Woods. The tallies were separated by just 29 seconds, coming at 12:13 and 12:42. The Winterhawks cut the lead to one with a goal by Jake Gricius, his second goal of the night, at 15:22. 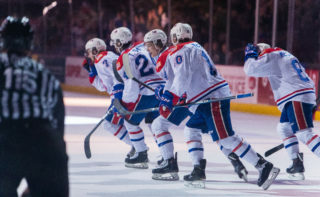 Portland’s Joachim Blichfeld tied things up at 4:04 in the third, but Spokane’s Nolan Reid answered at 5:41 with a snipe from just inside the blue line to put Spokane up 6-5. Portland responded with their third and fourth power play goals of the night to take a 7-6 lead. An empty netter by Blichfeld at 19:27 gave him five points on the night. Spokane’s Bailey Brkin, who saw no less than 14 shots in any period, saved 45 of 52 Portland shots. Farkas was 13 of 18 for the Winterhawks in 32:42 of ice time before being replaced by Dante Giannuzzi, who stopped 4 of 5 Spokane shots. Giannuzzi was between the pipes for the final 27:18 of the game. The Chiefs were 1/4 on their power play opportunities while the Winterhawks were were 4/7. 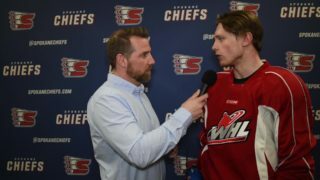 The Chiefs return to their home ice Friday, November 16 when they take on the Seattle Thunderbirds. It will be Coeurd d’Alene Casino Bingo Night with all fans in attendance getting the opportunity to play BINGO all game long for a chance to win prizes courtesy of Coeur d’Alene Casino! 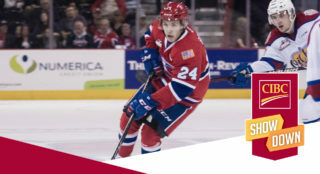 It will also be a Fred Meyer Family Pack Friday, meaning Chiefs fans can present their Fred Meyer Rewards Card at the Chiefs Ticket Office to receive a ticket to the game, a hot dog, and a Coca-Cola beverage for just $15! Mike Boyle will have the radio call on 1510 KGA, beginning with pre-game at 4:30 p.m. and puck drop at 5 p.m.